Image caption Is shedding weight harder while stressed or missing sleep? Managing sleep and stress levels can help in the battle against obesity, according to scientists in the US. 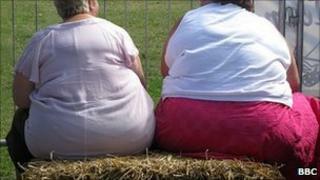 People getting too little or too much sleep were less likely to lose weight in a six month study of 472 obese people. Their report in the International Journal of Obesity showed that lower stress levels also predicted greater weight loss. A UK sleep expert said people need to "eat less, move more and sleep well". Approximately a quarter of adults in the UK are thought to be clinically obese, which means they have a Body Mass Index greater than 30. Nearly 500 obese patients were recruited for the first part of a clinical trial by the Kaiser Permanente Center for Health Research in the US. For six months they had to eat 500 fewer calories per day, exercise most days and attend group sessions. The authors report that "sleep time predicted success in the weight loss programme". People with lower stress levels at the start also lost more weight. The researchers added: "These results suggest that early evaluation of sleep and stress levels in long-term weight management studies could potentially identify which participants might benefit from additional counselling." Dr Neil Stanley, from the British Sleep Society, said the sleep community had been aware of this for a while, but was glad that obesity experts were taking notice. "We've always had the eat less move more mantra. But there is a growing body of evidence that we also need to sleep well", he said. "It's also true that if you're stressed, then you're less likely to behave, you'll sit at home feeling sorry for yourself, probably eating a chocolate bar." Dr David Haslam, chair of the National Obesity Forum, said: "It's a great idea to find predictors of who will respond to therapy, if this is a genuine one."